Printed table runners, also known as custom logo tablecloths, help you separate your business from competitors at exhibition halls, trade shows, shopping centres, and retail stores. The linens feature your custom designs digitally printed in vivid, full colour using a dye-sublimation process that ensures an accurate portrayal of your designs. 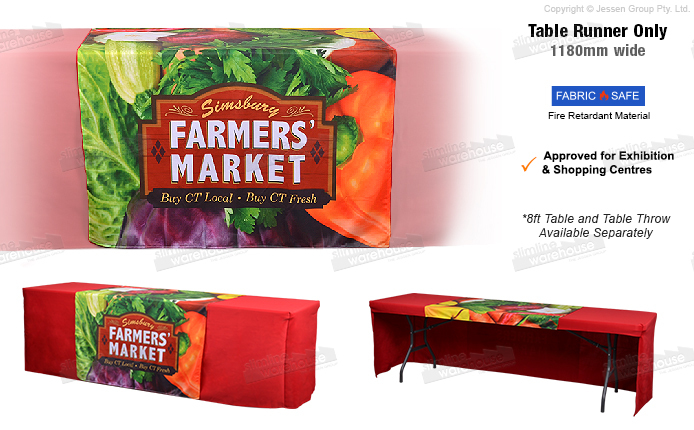 This style of custom cover offers the benefits of a full size table throw at a lower price point! The printed table runners are fairly large, with their 1180 x 1600mm size that will reach to the floor on standard sized tables in the front and back whilst covering a decent amount on the top. The promotional linens are great to use with a contrasting single colour table throw, ideally in your company's colour, to really make it pop and get passersby attention. The fabric used is polyester, which is flame retardant for safety and also machine washable in order to provide a long-lasting display that will last for years to come.